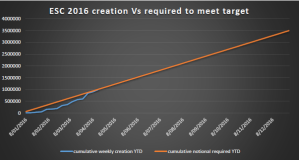 A quick update on how ESC and VEEC creation rates are comparing against the ‘run-rate’ required to hit the annual targets. For ESCs, there has been a slight uptick in the volume of ESCs being created in recent weeks. 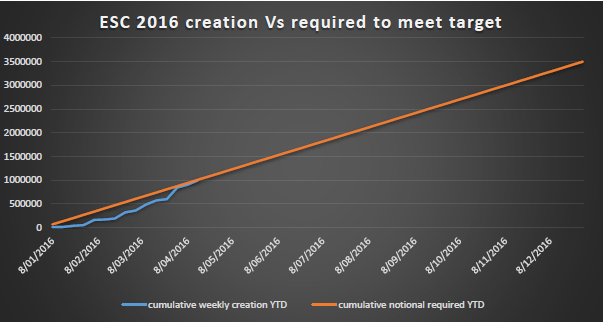 From the below graph, we can see that the number of ESCs being created each week is about equal with the run-rate required to meet the 2016 ESC surrender target. Whilst this does ignore the overhang from previous years, it does tend to point to a future softening in price if recent trends continue. On the VEEC front, there is a more bullish run of certificate creation taking place. Since commercial lighting activities seriously kicked off in January 2016, creation rates have outstripped that necessary to meet the target. This is one reason for the softening in price from the high twenties to low twenties in recent months. For more information about these trends, or to discuss your certificate trading needs, please contact Demand Manager, or visit our certificate pricing graphs here.